We never plan for an accident, but we can always try to be prepared for when one happens. Having a first aid kit for your pet is the first step to trying to be prepared; you can make your own or purchase one that is ready made. Be sure your pet’s permanent identification information is correct and have copies of the ID number. Permanent identification is a microchip (most are good internationally), tattoo (good for local use only and may fade with time). Collars and harness are not good ID as they are typically removed when an animal is injured. Different age groups and pet lifestyles have different kit needs. Pets who take medication regularly should have a couple of days supply of all current medications (be sure to rotate meds so they don’t expire). 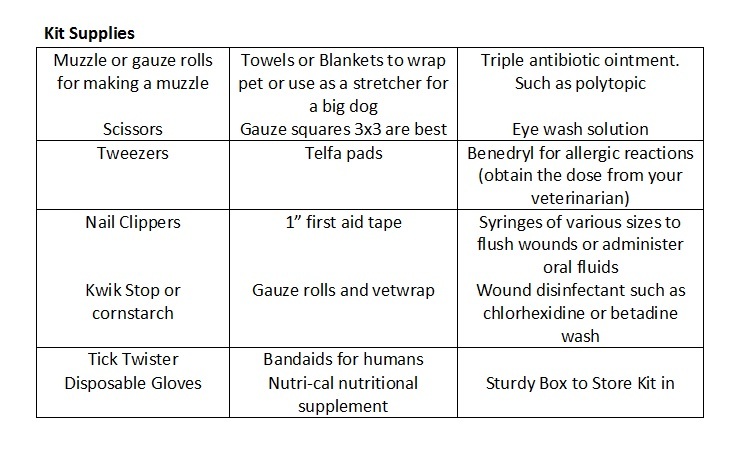 Be sure to ask your veterinary health care professional about any additional things your first aid kit may need for your pet. Consider taking a pet first aid course to help you be prepared. In the Edmonton area St. John’s Ambulance and the Edmonton Humane Society offer pet specific courses.